Christopher Nolan's latest film, Inception, is one of the best films that I've ever seen, combining an original story with a compelling future, providing a cerebral science fiction thriller that represents the very best of what the genre is supposed to do: provide a compelling and entertaining narrative. 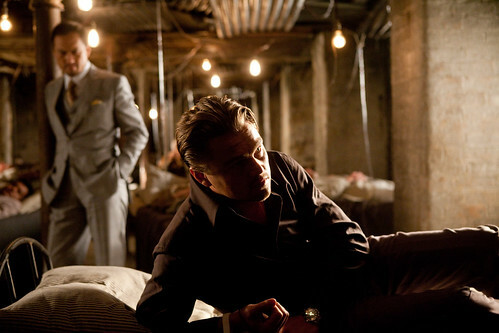 Inception is an event that is a beginning, and describes the goal of the characters of the film. As the film opens, Leonardo DeCaprio's character, Cobb, is caught while trying to break into a businessman's (Saito, played by Ken Watanabe) dreams, and is offered a job to plant an idea into someone's head. Cobb specializes in a particular form of theft: entering a person's mind during their dream state, and stealing particular secrets in a form of corporate espionage. Cobb is a haunted character, who's own guilt and demons have been coming back to haunt him. Exiled from the United States, his new job, to plant the idea of breaking up a corporate empire in the mind of an heir Robert Fischer (Played by Cillian Murphy), is the only thing that will allow him to return home to his children, after being forced away from the U.S. after the death of his wife: her suicide had appeared to be at his hands. Assembling a team of specialists: Joseph Gordon-Levitt as Arthur, the point man, Tom Hardy as Eames, the forger, Ellen Page, Ariadne the Architect, and Dileep Rao as Yusuf, the Chemist. They go to work building a complicated dream state for their target, with the plan to plant an idea deep inside his consciousness, where it would take form and provide the target with the motives to break apart his inheritance. Inception is a complicated, fantastic and brainy film, and is unequivocally a brilliant work of fiction, tying together different story elements: the job at hand, placing the idea into Fischer's head, and looking at what makes up an idea, all within several different worlds that have been created within the minds of the characters. While viewers are generally used to any number of time jumps to help tell the story: flashbacks, jumps forward and so forth, this is the first story that I've seen tell several stories within concentric time spans (i.e., one within the other), with each running at a different speed. The story moves forward in a fairly straightforward fashion as the team moves deeper and deeper into Fisher's unconscious mind to plant their own inception: Fischer must break apart his business. One of the things that works the best with this film is the subtle, science fiction elements that are placed in the film throughout. There is unnamed technology that allows for the shared consciousness, referred to as a military project for training soldiers, but something that seems to have branched out into the larger world. In one particular scene, Cobb and Saito visit Yusuf, the Chemist, who demonstrates his drugs by revealing a sort of opium den of dreamers, people who have spent too much time in the dream world. The scene, lit by bare bulbs and dim shadows, is as hauntingly beautiful as another demonstration scene in The Prestige, one of Nolan’s prior films. The soft touches here show restraint, but at the same time, reveal a near future world that has elements of science fiction and cyberpunk, but in a way that is far less radical, and in my mind, more realistic than other stories. At the story progresses, Cobb is haunted by his wife, who died after remaining in the dream state for far too long. Cobb noted that she has been causing problems with some of his work, sabotaging his efforts, and as Ariadne prepares for building the heist, she learns the very real dangers of the dream state, and of inception in the first place: Mal and Cobb had entered a deep dream state, one where they remained together, building and rebuilding their own world, and eventually, losing their grasp on reality. As Cobb worked to get her to leave the dream world, he planted the idea that if she were to kill herself, she would awaken. Upon returning to the real world, she continued to believe that she was in the dream state, and once again, killed herself. This plot element is one that grows alongside the heist, and proves to be one of the most interesting elements of the film: what is reality? This question is something that has long been asked from the science fiction medium, from films such as The Matrix, and television shows such as Life On Mars/Ashes to Ashes. The film takes an interesting look at what the perceptions of one's reality are. Within the dream state, people tend to operate within that context, and accept that reality for what it was. Inception does an interesting job with this line of thought, and it does look at this question in a different manner than some of the other works. Here, the characters know full well that they are operating within a different world, but even then, there are real risks in what they are doing. This is assuming one of two possible endings for the film: that Cobb returns safely to his home, reunites with his children and the story closes off normally. The alternative is that Cobb himself has remained in the dream world, and that the entire film had become a reality that he’s unable to escape from, and essentially, he is lost within his own mind. The ending itself brings the film from a good one to a truly great one, something that is sure to keep people thinking and talking about the movie for years to come. Despite the film's obvious strengths, there are some weak points in the film. The chief among these is the characters, who get very little in the way of the essential back-story that allows them to become relatable characters. Most of the team, while they get some time, are just fixtures against the background, where they operate simply to fulfill plot elements. Cobb is really the only character who has any sort of treatment towards this, and then, it is really only along the lines of putting major plot elements into place. Secondly, for a film about dreams, the internal mechanics of the dream world seemed to be fairly well in order. While this can be argued away as some sort of side effect of having someone create the world in the first place, there is very little surrealism that is generally experienced with dreams. Certainly, with my own, I have a feeling of confusion, followed by: "I thought that was really happening? ", given how strange some of them can be. At the end of the day, despite some of the drawbacks to this film, it falls under the same list of films that I love for many of the same reasons: they are original, intelligently written, acted and conceived of; movies such as Moon, District 9, The Fountain, Pans Labyrinth, Minority Report, and a couple of others. Inception easily meets the same requirements of those films, and I have no doubt in my mind that Inception will be just as highly regarded as these films are.